"Elena stood knee deep in the water. She clenched her teeth and tried to stop her body from shaking." When Elena's friend Angie convinces her to take swimming lessons, Elena would rather be anywhere else than the pool. As the other "Pollywogs" shout and splash, Elena stands rigid in the water. She thinks back to the time at Lake Nina when her Uncle Roy, not knowing she couldn't swim, pushed her off the dock. Elena vowed then she'd never forgive him. Now, as Ms. Waters gently encourages Elena to float, Elena finds a way to triumph and discovers friendship, trust, and forgiveness. 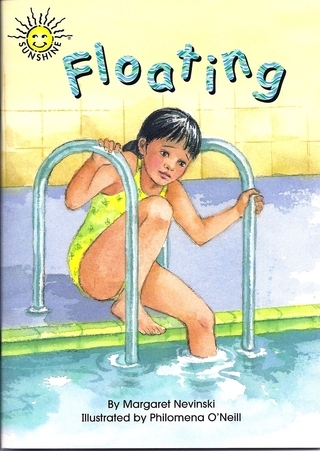 Floating (Wright Group/McGraw-Hill) tells the story of a girl's determination to overcome fear and past events. The book is used in classrooms (Grades 2-5) across the country. Floating won 2nd Prize in the category of Inspirational Fiction Story in the Children's Writer Contest. "All right, Pollywogs," said Ms. Waters. "Everyone line up here along the edge." Elena admired Ms. Waters, whom she had seen jump from the high dive. Her dark-chocolate skin contrasted with her yellow suit. Her voice was low and reassuring. "Elena, why don't you start us out?" Elena opened her mouth, but only a tiny squeak escaped. When I was growing up, I didn't know how to swim. I was afraid to go in water deeper than my knees. Once when I was with my family at a lake, an uncle assumed I could swim and tossed me into the water. Luckily my mom saw what happened and rescued me! I finally took swimming lessons when I was 19, and now I love to swim. Elena's story isn't my story exactly, but as I wrote it I remembered my fears and my sense of triumph when I could float! And like Elena, I've forgiven my uncle.